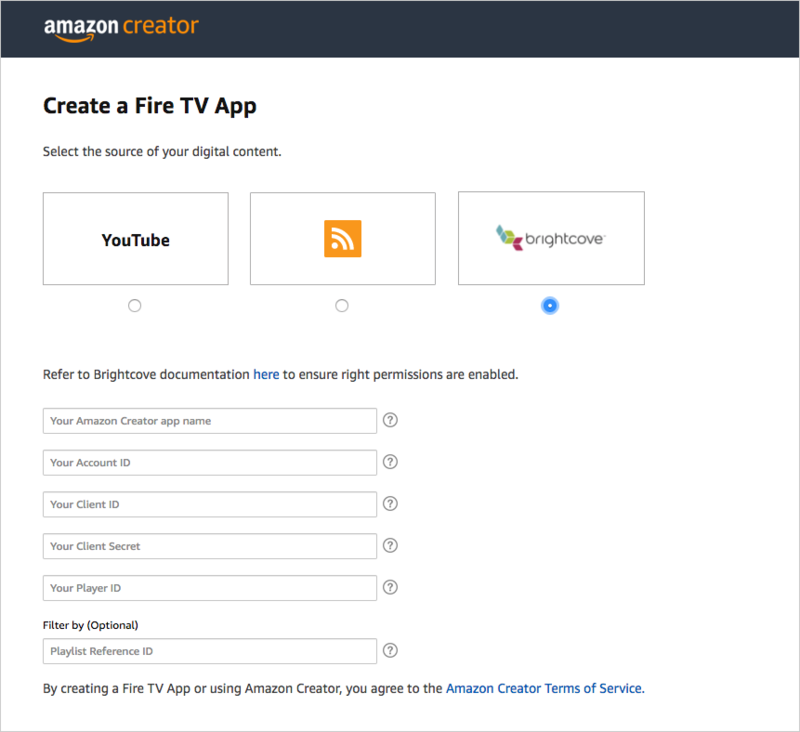 You can use Brightcove as a video data source with Amazon Creator. To configure Amazon Creator with Brightcove, you must have an active Brightcove account, with a valid account ID (also referred to as a "publisher ID"), client ID, client secret, player ID, and optionally Playlist reference ID. The following sections explain how to retrieve this information from Brightcove. Note: The following instructions assume you already have an account with Brightcove. Go to Brightcove Studio (https://studio.brightcove.com/) and sign in. In the upper-right corner, click ADMIN and select API Authentication. The application you're registering here is necessary to call the Brightcove APIs from Amazon Creator. For more details, see the "Creating client registrations" section in Managing API Authentication Credentials. Configure your permissions as shown above. After you click Save, you're shown a client ID and client secret. Copy the client ID and client secret and store them in a secure place. For example, open a text file on your computer and save this information there, as you will need it later when you configure Brightcove in Amazon Creator. After you copy the information, click OK, I copied it to close the "Copy Your Client Secret" dialog box. The dialog box closes and you're returned to the list of Brightcove apps for your account. To get your account ID (also referred to as the "publisher ID"), in the upper-right corner, click ADMIN and select Account Information. Copy the long number (13 digits) under Publisher ID. Store this account/publisher ID in the same place you copied your client ID and secret. Note: Brightcove sometimes refers to this long string as the Publisher ID, and in other places as the "Account ID." In Amazon Creator, it is referred to as the "Account ID." Whether referred to as the "Publisher ID" or "Account ID," the value is the same. The terms are synonyms. Go to Brightcove Studio (https://studio.brightcove.com/) and sign in, if necessary. 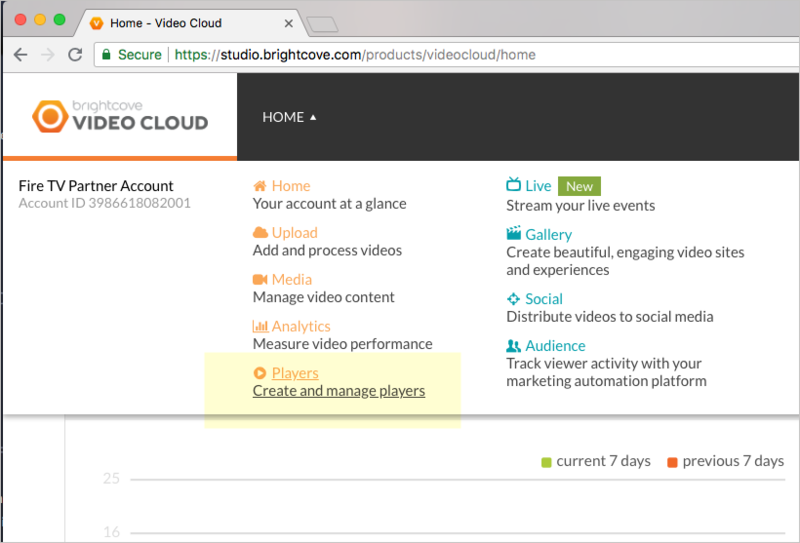 In the upper-left corner (next to the Brightcove Video Cloud logo), click the drop-down menu and then select Players. Note that the name of the drop-down menu defaults to whatever you last selected from its list of options. Initially, the drop-down menu is called "HOME." After you select "Players," the drop-down menu's name changes to "Players." Enter a Name (e.g., "Amazon Creator Player") and Short Description (e.g., "A player for Amazon Creator"). You can choose these values as desired, as they won't be visible to customers. Click Save. The new player appears in the list of players. Copy the ID that appears below the player's name, and store this information with the other Brightcove information you retrieved in the previous section. 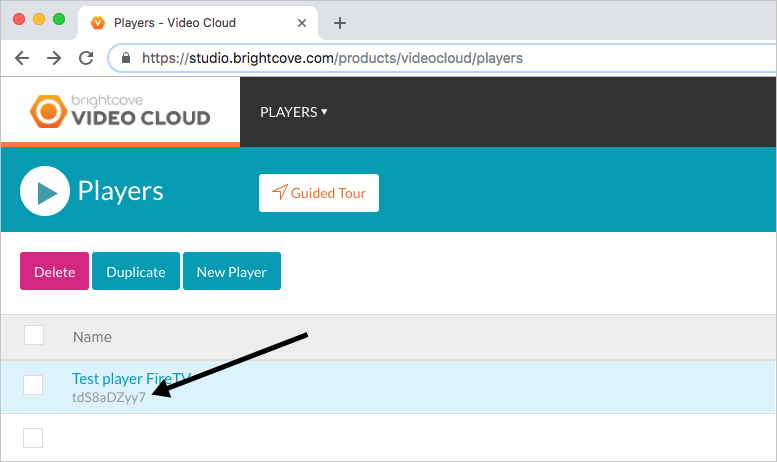 Important: For an ideal video playback experience with Brightcove videos on Amazon Creator, stick to the default Brightcove player settings. Ads are not currently supported. The Playlist Reference ID field filters playlists from your Brightcove account based on text matching. The Playlist Reference ID can be a prefix, postfix, or a part of the Brightcove Playlist Reference ID. As long as the reference ID contains the given matching text, the playlists corresponding to the matching reference IDs will be returned in results. For example, suppose you have five playlists in the Brightcove account with Reference IDs "Travel123", "Travel456", "Travel0", "News123", and "News" respectively. For a given reference ID of "Travel", these playlists will be matched and used: "Travel123", "Travel456", "Travel0". The Reference ID is not case sensitive. For example, a given input of "news" matches both "News" and "NEWS". Note: If no Playlist Reference ID is provided, all playlists from your Brightcove account will be displayed. To edit the Brightcove Reference ID in Amazon Creator, click Manage Apps, and then click the Edit button next to "Source." Now that you've retrieved your Brightcove client ID, client secret, account ID, player ID, and (optionally) playlist reference ID, as well as configured the right API permissions, you can insert this information into the corresponding fields when you Create an App in Amazon Creator. Note: The only information you're asked for that you didn't already retrieve is "Your Amazon Creator app name." This refers to the name you want to call your Amazon Creator app, not the application you created in Brightcove. This section lists troubleshooting information related to Brightcove configurations. If you see an error message with this note, first make sure that you have entered the incorrect values for account/publisher ID, client ID, and client secret. If all the information is correct, make sure you enabled the correct permissions in your Brightcove app. See Step A: Register a New Application in Brightcove above.